OCast ruybarbo L. Rheum officinale, Ar rībās, Fr. rhubarbe officinale Eng. rhubarb. 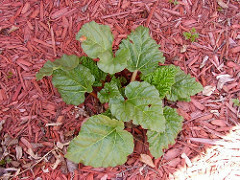 Rhubarb is a native of China. It was brought west via the Rha River (now called Volga) where it picked up its name. Then it spread to Greece and Levant (Italy). During Arab occupation of Spain it grew wild in the Sierra Nevada outside Granada and used not only for consumption but also for decorative gardens. Usually, the roots and seeds were bought in medical form as purgatives and subsequently as astringents. They were thought good for the humors. Further, the roots served as a medicine for cathartics. The juice from them relieved swollen gums. Stewed, in small doses, it has been given to children as a laxative. In cookery, the edible leaves became a common vegetable in Spain at least. They were eaten also as a fruit. The leaves were stewed or baked in pies and added to sauces. In Andalusia, rhubarb became an ingredient in recipes originating from Persia. The Bagdad Cookery Book calls for the juice extracted from the stalks to flavor meat. The Wusla il.a Al-Habib uses it as a vegetable serving it with chicken and meat in general. Perry indicates that the stems were macerated in those cases. Too, rhubarb was added to syrups, compotes, pastries and comfits and made into candy. The 13th C Anon MSS calls for rhubarb in a “Great Drink of Roots” and in a “Cheering Syrup”. The Archpriest of Hita mentions eating rhubarb with goat liver for lunch. Villena, in his cover letter to Sancho de Jarava with his manuscript of Arte Cistore for editing in the beginning of the 15th C, explains that it was generally used in sauces and prepared dishes in the Middle Ages. Calero added that it was used as much as it is in English bake goods today. Villena provides instructions on how to carve it. Spread a pie tin with butter and sprinkle with four. Line it with pie crust. Bake in oven 15 minutes to slightly brown crust and remove. 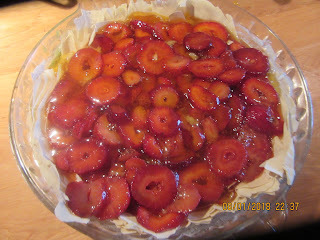 Mix the remaining ingredients and pour the filling into the pie pan. Dot with butter. Bake 35-45 minutes until crust is browned. The rhubarb and strawberry dessert is sweet enough and goes great with ice cream.